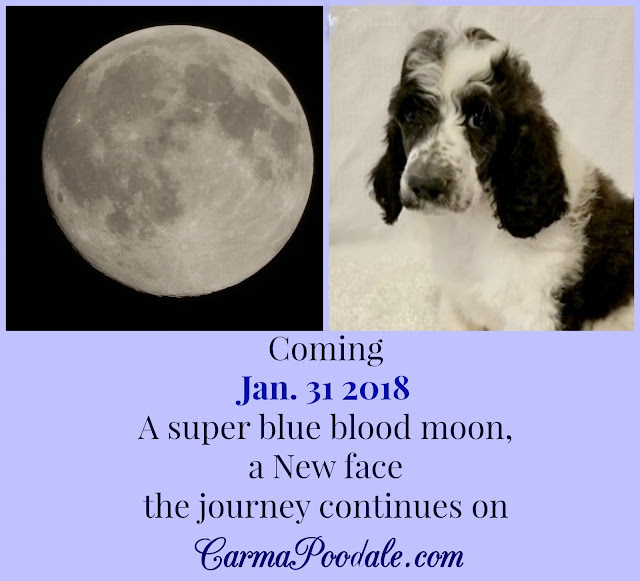 Carma Poodale : What Does A Super Blue Blood Moon and a Poodle Puppy have in Common? What Does A Super Blue Blood Moon and a Poodle Puppy have in Common? Wednesday morning I will be boarding a flight to St. Louis. I will be picking up my new PUPPY!!!! I will be sharing photos and videos on my journey. I haven't decided if I want to do it on our Facebook page or on Instagram. Which one would you want to see the broadcast on? How exciting. Safe travels for you and your new addition. Since we don't have IG, we'd prefer FB. Hooray for a new poodale!